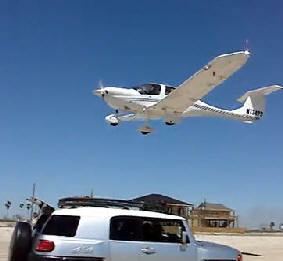 June 25, 2010 - The Federal Aviation Administration (FAA) revoked Joseph Bryan Kirbow of Beaumont, Texas of his pilots license for buzzing a crowed Galveston County beach in a single engine Diamond Aircraft DA-40 with an aircraft tail number N134PS. Kirbow endangered the lives of his two passengers as well beachgoers by flying as low as 15 feet above ground level on Saturday, March 13, 2010 between High Island and Crystal Beach. The FAA regulations are clear no pilot may operated an aircraft in a populated area no lower than 1,000 feet except during takeoffs and landings. Numerous complaints had been filed with the Galveston County Sheriff's Office and the FAA from beachgoers who had feared for their lives. Kirbow had buzzed the beach several times in his attempt to impress his passengers and boost his ego. One beachgoer, Terry Rodery said ?I wasn't sure what to think, I didn't know if I was gonna die. Or others in our group were gonna' die. At first I thought that he was going to crash or make an emergency landing. There was no room for him to do that." A number of beachgoers had videotaped the entire event and the FAA was able to track down the aircraft by its tail number. The aircraft was register to Kirbow Transportation Enterprises who owns and operates a flight school, Kusa Aviation out of Southeast Texas Regional Airport Beaumont, Texas. The FAA sent out an ?Emergency Order Of Revocation? for Kirbow to surrendered his airman certificate "immediately" on June 16, 2010. Kirbow has 10 day from that date to appeal the revocation of his pilot?s license. It does not appear Kirbow will appeal the revocation order due to the mounting evidence against him. Initially Kirbow had told the FAA that he had flown low to the beach because he was experiencing engine problems. However, eyewitness reported Kirbow was so low to the ground that each time he past over they could see him smiling and that they had to duck for cover. In an interview with the FAA, one of the passengers informed the FAA that she had asked Kirbow just after departure where he was going to take them Kirbow replied were going to ?buzz the beach.? In addition, at the time of the flight, the two passengers onboard had questioned Kirbow if they would be in trouble for flying so low to the beach. Kirbow said he had "buzzed the beach many times" and "would not get in trouble for it." The passengers also informed the FAA that Kirbow asked of them to lie about the events. Kirbow had asked one of the passengers to say she was ?never on that flight?. Kirbow also asked the two passengers to go along with the story that the aircraft was having engine problems. Kirbow held a Private Pilot license with an Instrument rating. He has now lost his privileges to act as pilot in command. In addition the FAA will not accept an application for a new airmen certificate nor shall one be issued from one year to the date of the revocation, at which time the FAA can again deny him an airmen?s certificate.